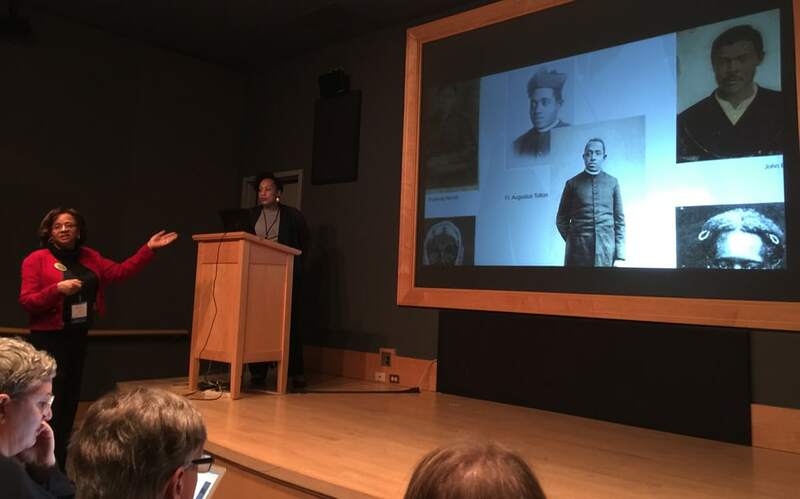 Patricia Bearden (left) and Raquel Flores-Clemons present “Partners in History: Chicago State University Archive and International Society of Sons and Daughters of Slave Ancestry Digital Collaboration" at DPLAfest in Chicago on April 20. 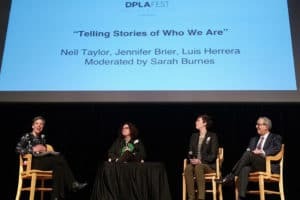 Hundreds of people from the Digital Public Library of America’s (DPLA) nationwide network of libraries, archives, museums, and cultural heritage organizations came to Chicago April 20–21 for DPLAfest, a series of presentations and workshops focused on digitization and access to collections. Several presentations highlighted efforts to document, preserve, and share digital collections on social justice and community engagement. “Partners in History: Chicago State University Archive and International Society of Sons and Daughters of Slave Ancestry Digital Collaboration,” led by Chicago State University (CSU) Archivist Raquel Flores-Clemons, Patricia Bearden, president of the American Family History Institute and the International Society of Sons and Daughters of Slave Ancestry (ISSDSA), and CSU Special Formats Catalog Librarian Gayle Porter explored how larger institutions like CSU can partner with smaller local organizations to fill in the gaps and give voice to marginalized communities. Flores-Clemons and Bearden highlighted the ongoing partnership between these two institutions and how it connects CSU, a majority African-American institution in Chicago, to the surrounding communities of Burnside and Roseland. ISSDSA, a nonprofit, originated in 1996 as ordinary Chicagoans sought to document the rich history of the African-American community on the South Side, celebrate their ancestors, and preserve slave genealogy for future generations. ISSDSA’s collection is housed as part of the Vivian G. Harsh Research Collection at Chicago Public Library’s Woodson Regional Library. The collaboration with CSU started through a connection with DPLA and Chicago’s Newberry Library and grew from there. The collection includes more than 400 photographs contributed by local residents, many of whom were also photographed with the items they brought in. With the guidance of an archivist, ISSDSA started developing a database of the photos and oral histories it had collected. “We didn’t know what we had, the richness, until we digitized it,” said Bearden. The materials collected include photos of Fr. Augustus Tolton, a runaway slave who escaped with his mother and siblings from Missouri to Quincy, Illinois, became a Roman Catholic priest, and is now being considered for canonization; Catherine Bean Douglas, who was owned by the Sisters of Charity of Nazareth, Kentucky, and settled in Chicago after emancipation; and many others showing African-American women, men, and families from all walks of life. Over the course of a year and a half, CSU provided a space to process the collections and equipment, while a trained ISSDSA volunteer processed the material. Major challenges to this effort were budget and time constraints—CSU and ISSDSA could provide only minimal training for volunteers and students. Working with this collection presented unique challenges, particularly finding means to reconcile and capture metadata using existing schema such as Dublin Core, as the photographs often had annotations and other markings on the front and verso. The project team wound up using a variety of resources to help model their metadata, including the online collections of the Consortium of Academic and Research Libraries in Illinois. “Tell Us How UC It: Creating a Living Archive to Affect Social Issues in Your Community,” led by Cristela Garcia-Spitz and Tamara Rhodes with the University of California, San Diego (UCSD) Library, discussed efforts to create a “living archive”—an online collection and physical exhibit that connects and contextualizes student activism within UCSD’s campus climate and history. Marginalized communities at UCSD were targeted in recent years at events that included threatening, anti-immigrant chalk graffiti across the campus and a fraternity-hosted “Compton Cookout” in 2010 that depicted racist stereotypes and openly mocked Black History Month. These events highlighted the need for conversations on how the campus community experiences these issues. Observing this, librarians at UCSD wondered what role the library could and should play. 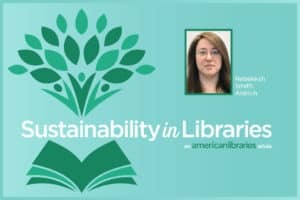 Rhodes, subject librarian for psychology, cognitive science, human development, and linguistics, drew on her previous research of ways libraries can support social movements. “Everybody we’ve been talking to on campus wanted to make something like this for a very long time,” she said. The result was “Tell Us How UC It: A Living Archive,” composed of both an online collection and a physical exhibit in the library that aimed to put current campus sentiment in conversation with UCSD’s history. The physical exhibit shows events by decade since UCSD’s founding in 1960 as well as contemporary student newspapers, fliers, and other documents that capture student activism. In assembling the exhibit, the library used direct quotes and shared information rather than persuaded. “We were mindful to keep a balance—not just what students hated but what the university did in response,” said Rhodes. The library was particularly interested in what students were feeling in the moment. Staffers asked students for their feedback on current events, racism, and charged words. The exhibit team called for submissions and promoted at campus community centers and residence halls as well as student newsletters. To help give the project weight, the exhibit team collaborated with two classes, including an undergraduate writing course where students submitted their reflections to the online archive, and a visual arts class, whose students created artwork depicting and interpreting current events as part of their final project for inclusion in the exhibit. The physical and online components of the exhibit invite contributions from the campus community; to prevent hate speech, the library posted UCSD’s Principles of Community values statement prominently but sought to not censor the reactions that were shared. Challenges throughout the process included the many administrative hurdles of getting the project approved through the university and technological platform issues to host the content.